The Isenberg School of Management at UMass Amherst has received approval for a search for the Eugene M. Isenberg Professorship for Innovation and Entrepreneurship. The closing date for this chaired professorship is April 1, 2011 or until the position is filled. The Search Committee consists of Faculty from the Operations Management, Management, and Marketing disciplines since it is expected that the holder of this professorship will be in one of these areas, and the VCRE at UMass Amherst, Professor Michael Malone. A link to the position description on the Isenberg School site is here. Ads for this position are expected to be placed in The Chronicle of Higher Education, ORMS Today (online), ASEE Prism, among other venues. The previous holder of this chaired professorship was Dr. Soren Bisgaard, who passed away on December 14, 2009. Other holders of Isenberg chaired professorships are Dr. Michael "Mike" Malone, who is the Isenberg Distinguished Professor of Engineering, in addition to serving as the Vice Chancellor for Research and Engagement, and Dr. Lawrence M. Schwartz, who is the Isenberg Professor in Integrative Science, and who was named this past year. These professorships are endowed by Ronnie and Eugene M. Isenberg, after whom the Isenberg School of Management is named. My brain is still percolating from all the interesting talks that I attended and people that I met at the AAAS Annual Meeting that took place recently in Washington DC. I also very much appreciate the excellent coverage of the science at this terrific meeting by the media since it is very important to get the news about exciting and important research out! 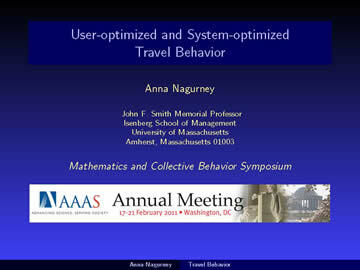 The Mathematics and Collective Behavior Symposium at the AAAS Meeting was truly enjoyable to be part of. As for media coverage, an article in Science News, entitled, "Model Copes with Chaos to Deliver Disaster Relief, " discusses our research on the design of supply chains for critical needs products from vaccines and medicines to humanitarian relief supplies as well as our research on the management of perishable, life-saving products as in the case of blood supply chains. It also mentions the work of Iain Couzin, who was a fellow panelist of mine at this symposium. Iain and I first met when we were panelists on the Traffic: From Insects to Interstates panel at the World Science Festival in NYC in June 2009 and we had a fabulous time at that event, as well. The Economist, in its latest issue, also has coverage of Collective Behaviour (British spelling) in a report on Couzin's research in the article: Follow my leader: A group’s “intelligence” depends in part on its members’ ignorance. The article has a gorgeous photo of fish swimming, since that is one type of animal that his research focuses on, but his movies of animals moving and migrating are truly something to behold. The National Science Foundation, with NBC News, has produced a series of wonderful videos of winter sports, with a focus on last year's Winter Olympics in Vancouver, and the science behind the sports. I especially appreciate the videos on figure skating (yes, my daughter is a figure skater, and also plays on a couple of varsity sports teams); the material science behind skates from the boots to the blades and how they differ for speed skates, hockey skates, and figure skates, and the math behind sports. These short videos include faculty speaking on their research in sports. Several faculty from Ithaca College, Cornell University, and Williams College (the host of the recent Bay State Games) give great deliveries of their work, to name just a few. You can see such athletes as Apollo Ohno and Rachel Flatts, to name just two, in the videos. And for all of the skiers out there, there are several videos focused on skiing, just for you! These videos are engaging, informative, and very well-done, so enjoy! I even heard "optimization" mentioned in the context of sports, which was great to hear! You can access all the Science of the Winter Olympic Games videos here. Intellectual Giants that made all the above possible! INFORMS Regional Conference at UMass Amherst -- Deadline is Tomorrow! INFORMS distributed the above flyer today reminding everyone that the deadline for paper submissions is tomorrow, February 25, 2011, for the First Northeast Regional INFORMS Conference that takes place at UMass Amherst May 6-7, 2011! Dr. Brenda Dietrich of IBM is giving the plenary talk and there will be several exciting panels. We expect over 150 presentations! Professor Nilanjana Dasgupta and graduate students: Jane Stout, Matthew Hunsinger and Melissa McManus, who are social psychologists at UMass Amherst, in a fascinating set of studies, found that academic contact with women, who have succeeded in science, technology, engineering, and math (STEM), can enhance positive attitudes and boost self-confidence among girls and young women who, in other situations, feel less confident and interested in science majors or careers. The writeup of their study appears in the February issue of the Journal of Personality and Social Psychology. They found that, for young female students at the beginning of college, who are considering STEM majors and careers, having contact with female scientists and engineers as professors or, amazingly, even through websites, plays a role in helping them to see themselves as scientists. Interestingly, however, for male students, the professor’s gender is less important, but for female students it makes a big difference in STEM classes! UMass Amherst issued a press release on the paper that summarizes the researchers' findings, which stated: "Increasing the visibility of female scientists, engineers and mathematicians, and providing young women who are beginners in these disciplines the opportunity to have personal contact with them, profoundly benefits their self perception in STEM," the researchers noted. The women subjects tried harder on difficult math tests, showed more positive attitudes toward math and engineering, identified with these disciplines more strongly and felt more empowered about their ability to do well in the future after being exposed to female scientists and engineers rather than males. "We’re using the term ‘stereotype inoculation’ as a medical metaphor. Like a vaccine, female role models inoculate or protect girls and women’s interest in STEM professions and make them more resilient to societal stereotypes (the virus)," Dasgupta explains. "What was most exciting to us was that implicit negative feelings toward math expressed by these young women reversed and became strongly positive after they had contact with female role models in math and science. Similarly, implicit dis-identification with math became strong identification after they had contact with female role models." I must thank my high school math and science teachers, several of whom were women. Amazingly, while an undergrad at Brown I never had a female professor in any math, science, or engineering subject, but heard from some of my female friends and fellow concentrators in Applied Math, that there was a female professor named Stella Dafermos. At that time, she was the only female professor in either Applied Math or in all of Engineering! I met her when I became a doctoral student and she became my dissertation advisor. On numerous occasions during my world-wide travels and extended stays at other universities abroad, I have had female students come up to me and say how important it is for them to see a female professor who is happy and (their word) successful. One gets the same feedback even at home and just today a former undergrad student of mine stopped by to just chat about the great job that she will start after graduation and the possible challenges that she may face as a technical female, who, I might add, ultimately wants to get a PhD in Operations Research! If you can imagine it, you can do it! Blood is a life-saving "product" and, at the same time, it is highly perishable. Its delivery is also time-sensitive. In addition, since blood is not manufactured, there is risk associated with the supply side of the blood supply chains; that is, the blood drive sites. Blood service operations are a key component of the healthcare system all over the world. According to the American Red Cross, over 39,000 donations are needed everyday in the United States, alone, and the blood supply is frequently reported to be just 2 days away from running out. Of 1,700 hospitals participating in a survey in 2007, a total of 492 reported cancellations of elective surgeries on one or more days due to blood shortages. While for many hospitals, the reported number of blood-related delays was not significant, hospitals with as many days of surgical delays as 50 or even 120 have been observed. Furthermore, in 2006, the national estimate for the number of units of whole blood and all components outdated by blood centers and hospitals was 1,276,000 out of 15,688,000 units. Considering also the ever-increasing hospital cost of a unit of red blood cells with a 6.4% increase from 2005 to 2007 further highlights the criticality of this perishable, life-saving product. The New York Times reported in 2010 that this criticality has become more of an issue in the Northeastern and Southwestern states in the United States since this cost is meaningfully higher compared to that of the Southeastern and Central states. Moreover, hospitals were responsible for approximately 90% of the outdates, with this volume of medical waste imposing discarding costs to the already financially-stressed hospitals. In the paper, "Supply Chain Network Operations Management of a Blood Banking System with Cost and Risk Minimization," my doctoral students, Amir Masoumi, and Min Yu, and I, developed a network optimization model for the complex supply chain of human blood. In particular, we considered a regionalized blood banking system consisting of collection sites, testing and processing facilities, storage facilities, distribution centers, as well as points of demand, which, typically, include hospitals. Our multicriteria system-optimization approach on generalized networks with arc multipliers captures many of the critical issues associated with blood supply chains such as the determination of the optimal allocations, and the induced supply-side risk, as well as the induced cost of discarding the waste, while satisfying the uncertain demands as closely as possible. Indeed, since it may be difficult to predict the demand, it is essential to capture the uncertainty associated with the demand in an appropriate modeling and computational framework. This research we will be presenting at the POMS Conference in Reno, Nevada, as well as at the Northeast Regional INFORMS Conference at UMass Amherst. The supply chain network model for the optimization of blood supply chains is part of our growing body of research on healthcare-oriented supply chains with applications even in disasters. For example, results in the study, "Supply Chain Network Design for Critical Needs with Outsourcing," co-authored with Min Yu and Dr. Patrick Qiang, can also be applied in disaster relief. It is especially gratifying to see students so engaged in research that can have a positive societal impact! In my previous post, I highlighted the Mathematics and Collective Behavior Symposium and discussions at the AAAS meeting taking in Washington DC. The theme of the AAAS Meeting this year is Science Without Borders. It was really nice to see that there were other operations researchers at the AAAS meeting. Dr. Karen Smilowitz of Northwestern University stopped by before the symposium that I was speaking at to say hello so we took the photo above. Smilowitz had organized a symposium with Dr. Ozlem Ergun of Georgia Tech., entitled: Doing Good with Good O.R, which took place yesterday afternoon. Today, the newly elected AAAS Fellows will be inducted at the meeting in DC, and one of my colleagues at UMass Amherst, who is also a neighbor of mine, the chemist Dr. Sankaran "Thai" Thayumanavan, is in this deserving group. And as I stated in my previous post, the forsythia were blooming in DC -- see bottom photo above, taken on February 18, 2011 outside the hotel that I stayed at -- the Morrison Clark, which is a converted mansion and is a historical hotel -- simply fabulous and within a few blocks of the Washington Convention Center, the venue for the AAAS meeting this year. I hope to be able to participate in other AAAS meetings in the future! The AAAS Meeting taking place now in Washington DC is simply fantastic -- the weather the past two days was mild (with even forsythia starting to bloom) but, best of all, are the fascinating talks and the level of science and discussion at this meeting. I have been on an intellectual "high" since arriving in Washington. This conference with about 1,000 speakers is taking place at the Washington Convention Center. Yesterday, the Mathematics and Collective Behavior Symposium took place, which was organized by Dr. Warren Page. Dr. Iain Couzin began the symposium with gorgeous videos of birds swarming, fish swimming, and throughout his presentation interwove clips of animal collective behavior (including that of sheep and caribou) coupled with some of the mathematical modeling and simulations that he conducts in his laboratory at Princeton. He even included results of a study that he did on undergraduates to try to understand pedestrian movements. Dr. Pierre Degond then discussed his really interesting work on pedestrian flows and how the flows tend to assemble into lanes of traffic. He even mentioned cost functions associated with transportation flows. Both these speakers captivated the audience and the Q&A was great, but much too short. One audience member even noted crowds in disasters, so when it came for me to present my talk on User-optimized and System-optimized Travel Behavior, I was really ready, given the energy on the panel and in the audience. In my presentation, I discussed the role that congestion is playing not only in urban transportation networks but also on the Internet and electric power networks. We are living in a nonlinear world. I spoke about selfish versus non-selfish travel behavior and the implications for congestion and travel time. I brought out the Braess paradox, how we got to translate the original article, which had been published in German in 1968, with Professor Dietrich Braess and Dr. Tina Wakolbinger, so that scientists from any discipline could readily read its contents. I spoke about the methodologies that we use, and have developed, to formulate and solve centralized (system-optimized) versus decentralized (user-optimized) decision-making problems in a unifying way and how the theory of projected dynamical systems can be applied to capture the dynamic adjustment processes underlying a plethora of equilibrium problems, including traffic. I also spoke about what happens to the user-optimized flow patterns as demand varies over time and noted a recent result (in a theorem) that establishes that, as demand increases, the Braess paradox works itself out, suggesting a wisdom of crowds phenomenon, even in selfish networks. in which travelers only care about their own best route of travel. I also talked about the network efficiency / performance measure that Dr. Patrick Qiang and I constructed that has been used to assess the importance of various links in transportation networks around the world. I then went on to discuss our research on disasters and what concepts of movements need to be addressed there, as well as, how system-optimization can help in the optimal design of humanitarian-based supply chains for critical needs products. I brought up how how research in network models, variational inequalities, and projected dynamical systems has now been applied to predator-prey systems and food webs, with notable success in fisheries, which helped to tie the talks at the symposium together. The questions after my presentation were wonderful, thanks to such a knowledgeable and insightful audience, and many in the audience stayed for quite a while longer, after the symposium had officially ended, since there were so many interesting issues brought up, even potential applications to healthcare. I got a chance to speak with a female computer science faculty member from Howard University and a researcher who works in defense in Canada, the country of my birth. I also had a chance to speak with journalists from Science News, The Economist, and was interviewed by a radio show host from Milan, Italy (now, how cool is that)! Of course, I had to tell him that the paper that I wrote (and had included a reference to in my presentation) that showed how the traffic flows evolve as demand varies in the Braess network (with applications to the Internet) was written with Professor David Parkes of Harvard and professor Patrizia Daniele of the University of Catania in Italy! I then had lunch with a journalist who focuses on the pharmaceutical industry, and we could not stop talking about global supply chains for medicines as well as food. The symposium was taped and I believe that AAAS will make it available. My presentation, in pdf format, can be accessed here. And today I found a paper that discusses models of crowds, panic behavior, and disasters and that cites not only my translation with Braess and Wakolbinger, but even work of Professor Constantine Dafermos of Brown University, who was the husband of my dissertation advisor at Brown University, Professor Stella Dafermos, who passed away two decades ago. The abstract notes that the researchers' model is able to reproduce the so-called Braess paradox for pedestrians! And, yesterday, we even noted that, when it comes to evacuations, it may be best to actually have a divider in the exit door -- reducing capacity may actually improve traffic flow! Congrats to IBM on Watson's Win on Jeopardy and to All Researchers Who Contributed! If you have not heard, the supercomputer named "Watson" beat two humans on Jeopardy, and garnered, or its developer, IBM, did, the one million dollar prize! Facing certain defeat at the hands of a room-size I.B.M. computer on Wednesday evening, Ken Jennings, famous for winning 74 games in a row on the TV quiz show, acknowledged the obvious. “I, for one, welcome our new computer overlords.” he wrote on his video screen. For I.B.M., the showdown was not merely a well-publicized stunt, but proof that the company has taken a big step toward a world in which intelligent machines will understand and respond to humans, and perhaps inevitably, replace some of them. The Times article is already noting how IBM is pursuing medical applications with the technology behind the question answering computer. However, Watson was not perfect and, in an answer, had Toronto being a city in the United States. Time for a Geography Bee competition. UMass Amherst and MIT contributed to the technology behind Watson. The Boston Globe ran a nice report on the research done in Massachusetts that contributed to its success. The UMass contribution to Watson was information retrieval technology that helps Watson in the very first steps it takes when it is challenged with a question, allowing it to look for and retrieve text that is most likely to contain accurate answers. According to a press release issued earlier by UMass Amherst, which details other contributors, Watson is named after IBM founder Thomas J. Watson and was built by IBM scientists who wanted to create a computing system to rival a human’s ability to answer questions posed in natural language with speed, accuracy and confidence. The "Jeopardy!" format provides the ultimate challenge because the game’s clues involve analyzing subtle meaning, irony, riddles and other complexities in which humans excel but computers traditionally do not. Speaking of IBM, Dr. Brenda Dietrich, VP of IBM in the Research Divisions, will be giving a plenary talk at the Northeast Regional INFORMS Conference at UMass Amherst, May 6-7, 2011. Her plenary abstract is below. A smarter planet is emerging, through instrumentation of physical entities, the integration of information and control enabled by this instrumentation, and the intelligence to manage the entities efficiently and effectively. Examples include transportation systems, buildings, electrical grids, health care systems, governments, and supply chains. Achieving this smarter planet vision requires extensive data analysis, modeling, and optimization - in short, the application of operations research. In this talk some early examples of the use of OR to enable this vision will be described. Our field's potential and some emerging challenges will also be discussed. And, if you want to learn even more about Watson, you may listen to the INFORMS podcast with Stephen Baker. Research is hard but research can also be a lot of fun! When opportunities come your way, you should take advantage of them because they may not only open doors but also provide new directions for intellectual explorations and collaborations. Last Friday, I wrote about the wonderful time we had with our inaugural "Meet the Executive" event, which featured our alum, Mr. Marc Schneider of PVH. We were honored and, frankly, thrilled, that Mr. Schneider, who is an executive in the fashion industry, and is based in NYC, was speaking to us during Fashion Week. His talk and visit were truly inspirational and with the extraordinary positive feedback that we have received, we will do another such event this semester. Interestingly, and this I did not expect, some of the most engaging conversations at the lunch that followed took place among the men (and women) discussing fashion at our University Club, which is in a building that dates to 1728! I noted at the lunch that one of my doctoral students, Min Yu, who was also present, and I have been conducting research on fashion supply chain management for the past year and I am deriving guilty pleasure from working in this area. Also, I could not resist wearing a pink Longchamps silk scarf last Friday that was given to me as a gift for speaking at the Management Science Forum at Fudan University in Shanghai, back in 2006! Not much research has been done in fashion supply chain management. Firstly, fashion is a creative industry and there are presently unique challenges with fast fashion making a big impact, plus issues regarding the increasing costs of raw materials, including cotton, leather, and polyester, and the big role of outsourcing in this industry. In addition, this industry is seeking to minimize waste and its pollution imprint (or at least some players are). At the same time, fashion is an industry in which brands matter and there is competition among brands. Min and I became intrigued both by the time-sensitivity of various fashion products as well as by the sustainability issues. Our latest collaboration resulted in the paper, "Fashion Supply Chain Management Under Oligopolistic Competition and Brand Differentiation," which has now been accepted for publication in the International Journal of Production Economics, Special Issue on Green Manufacturing and Distribution in the Fashion and Apparel Industries. Our paper that focuses on fast fashion, entitled: "Fashion Supply Chain Management Through Cost and Time Minimization from a Network Perspective," will be the lead chapter in the book, Fashion Supply Chain Management: Industry and Business Analysis, which is edited by Dr. T.-M. Choi, and is scheduled to be out in April 2011. The seeds for this research must have been planted early, since even one of my former undergrads, Christina Calvaneso, who worked as a Center Associate of the Virtual Center for Supernetworks that I direct, and went on to work for GE and Deloitte, is now working for Rent the Runway in NYC in a senior finance capacity! Moreover, one of the undergrads at our lunch last Friday, who had interned at Goldman Sachs last summer, and is from Hong Kong, has accepted an offer from Deloitte and hopes to work in consulting for the fashion industry. My husband provided me with some comic levity to break up my work on a symposium presentation for the upcoming AAAS meeting in DC later this week, by pointing me to the latest PhD Comics strips. Many graduate students are familiar with (and subscribe to) PhD Comics by Jorge Cham, but, in case you have not heard about this entertaining comic strip, you can find more info here. Meet the Executive Event a Big Success -- What a Day! Today, we hosted Mr. Marc Schneider, the Group President of Dress Furnishings at Phillips Van Heusen (PVH), as part of our "Meet the Executive" initiative. The announcement even made the UMass Amherst homepage. Mr. Schneider, who is an alum of our School of Management, was simply fantastic. You should go for a career and not for a "job." He spoke about how he began his career at Macy's and benefited from its outstanding training program. What creates success? -- preparation, clarity of objectives, and putting the work in! Do not be outworked! Those who succeed aren't necessarily smarter -- whatever profession you select, you must be good at it. The successful ones are the ones who have worked the hardest. Make sure that you do your homework. In business, you must know finance, marketing, logistics, and organizational behavior. You need a toolbox of capabilities. I create value, he said -- I set the strategy and create the roadmap. I set the structure and populate it with great people. I give them the space to succeed and encourage them to execute with distinction. One needs to focus on the end results and to build a good team and to collaborate. Mr. Schneider also emphasized the importance of mentoring and looking at the longer view. He regaled us with his travels as part of his work and he always combines work and pleasure when he travels. He was asked about the greatest obstacles that he has faced, about the relative importance of face time vs. electronic communication (he is on 24/7 and loves it that way), and about whether he is always learning (indeed, he is, and sometimes will go to the library for a couple of hours to just reflect and think). And, yes, he was even at the Super Bowl game last weekend in Dallas (PVH works with the NFL) and was also there at various festivities since his company had corporate seats. He highlighted how football players have to work really hard to make it to the NFL and those who make it to the Hall of Fame are those who have worked the hardest. His near-term travels will take him to LA, where he regularly checks out a manufacturing plant, to Reno, to Milan, and then to China. He was in Istanbul last summer. It was fascinating to hear him speak on the global supply chain of his fashion products and to hear about the role of information technology (he even reworked this aspect of the business). His decisions as to where to outsource and the associated risk in the world that we live in today he analyzes very thoroughly because they will affect many. He even mentioned how the events in Egypt are affecting the delivery of some of his company's products! And we all know what happened in Egypt today! What came through is his energy, his love of his career, his curiosity about the world around him, and his willingness to advise and mentor our students. The lunch at the University Club at UMass Amherst was not only delicious but the conversations continued and were so warm and entertaining. Thank you, Mr. Marc Schneider, for a visit we will all remember and, think, he could have just stayed in Manhattan with this being Fashion Week! Thank you also for noting the great education that you received in our school -- and he is now responsible for a business valued at an amount with a 1 followed by a lot of zeros! You can find more photos from this and our UMass Amherst INFORMS Student Chapter activities on the chapter homepage, which also has links to Facebook and Twitter. The AAAS Annual Meeting is taking place next week (and weekend) in Washington DC, February 17-21, 2011. This year's theme: Science Without Borders will integrate the practice of science, both in research and teaching, that uses multidisciplinary approaches to problem solving, crosses conventional borders, and takes into consideration the diversity of investigators and students. The program will feature sessions with strong scientific content across many science and engineering fields. About 1,000 scientists will present multidisciplinary research and developments to nearly 8,000 meeting attendees, so there will be great networking opportunities! I am especially delighted by the symposia that have been organized under fascinating themes and will be a speaker in the Mathematics and Collective Behavior Symposium as part of the Emerging Science and Technology track. This symposium was organized by Dr. Warren Page, whom I met following the Traffic panel that I was on at the World Science Festival (WSF) in NYC in June 2009. Joining me at this symposium will be Dr. Iain Couzin of Princeton University (who was a fellow panelist of mine at the WSF) and Dr. Pierre Degond of Paul Sabatier University in France. Dr. Andrea Bertozzi of UCLA was scheduled to participate but will not be able to. Flows on physical networks, ranging from congested urban transportation networks to the Internet, are the result of users interacting with one another and the infrastructure. User-optimized travel behavior and system-optimized travel behavior result in entirely different flow patterns, with implications for congestion engineers and network designers. User-optimized behavior (sometimes referred to as selfish behavior) corresponds to travelers selecting individually their cost-minimizing routes of travel. In system-optimized (unselfish) behavior, a central controller routes the traffic in a manner that minimizes the total cost to society. Under user-optimized behavior, the addition of a new link to a network may increase the travel cost to every user. This counterintuitive phenomenon is known as the Braess paradox. We will discuss the relevance of this paradox to both transportation networks and the Internet, and demonstrate that the paradox may correct itself as the network’s demand increases. I'll be sure to write about m experiences in DC at the AAAS meeting, as I did about the Transportation Research Board meeting in DC just last month! I just received the letter below announcing the recipient of the Deutsche Bank Prize in Financial Economics 2011 and hearty congratulations are in order to Professor Kenneth Rogoff of Harvard University! Annually, I get a request to nominate a deserving individual and this choice is excellent! The Center for Financial Studies (CFS) has announced Kenneth Rogoff, Professor of Economics and Thomas D. Cabot Professor of Public Policy at Harvard University, as the award winner of the Deutsche Bank Prize in Financial Economics 2011. The Jury has chosen Professor Rogoff for his pioneering contributions in the field of international finance and macroeconomics, including research on exchange rates and central bank credibility. His work on sovereign default and debt restructuring, global imbalances, and the history of financial crises is highly relevant for understanding and addressing today‘s global challenges. The academic prize, sponsored by the Deutsche Bank Donation Fund, carries an endowment of € 50,000 and is awarded biannually by the CFS in partnership with Goethe University Frankfurt. The Deutsche Bank Prize in Financial Economics honors internationally renowned economic researchers whose work has a marked influence on research concerning questions of financial economics and macroeconomics, and has led to fundamental advances in economic theory and practice. The presentation of the prize by Josef Ackermann, CEO of Deutsche Bank, will take place as part of an academic symposium in Frankfurt on 22 September 2011. Please do not hesitate to contact us, in case you have any queries. But there is more exciting news, and a local connection to the Isenberg School -- it is being reported in various newspapers globally that one of our MBA graduates, Anshu Jain, is being tipped to be Deutsche Bank's co-head. There has been speculation about this news for months now in the financial news media. The report, Globalization of Management Education: Changing International Structures, Adaptive Strategies, and the Impact on Institutions, is available free to members of the association and can be purchased by others. Information is available on the association's Web site. In all the courses that I teach at the Isenberg School, I bring an international perspective. For example, I compare transportation and logistical systems around the globe, present cases of global supply chains, highlight risk associated with different partnerships, and draw in the students who have had international experiences to bring in their experiences into the discussions. The majority of the student team projects have an international component and the students dream up these projects, which are not only fascinating, but very well-done. To view some of them, click here. Even in my graduate classes, students do projects and presentations and one of the most intriguing ones (I feel it preceded "history in the making") was by a student from Egypt who presented a project, this past December, on the optimization of waste management in her country! As for our international activities at the Isenberg School of Management, there are numerous exciting intiatives. For example, one that I am personally involved in and very excited about is the 2011 IEEE Conference on Supernetworks and System Management that will take place in Shanghai, China at the end of May. I am an honorary co-chair of this conference, with Professor Ying-Luo, who is a Fellow of the Chinese Academy of Engineering. Several of my former doctoral students are involved in the conference through the Virtual Center for Supernetworks, including Professor June Dong, who is at SUNY Oswego's School of Business, and is the conference Co-Chair. Dr. Patrick Qiang is involved and one of my present doctoral students, Min Yu, will also be speaking at this conference. Keynote speakers at this conference include Professor Kieran Donaghy of Cornell University and Professor Hani S. Mahmassani of Northwestern University, along with Professor June Dong. I will also be giving a keynote talk, entitled: Supernetworks in Healthcare and Humanitarian Operations. Coincidentally, a group of our undergrads from the Isenberg School will be in Shanghai, China, when our conference is taking place, so we are looking forward to a great photo-op! 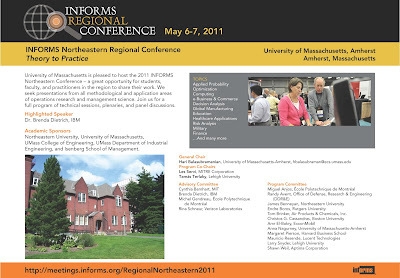 More on the Northeast INFORMS Regional Conference at UMass Amherst! 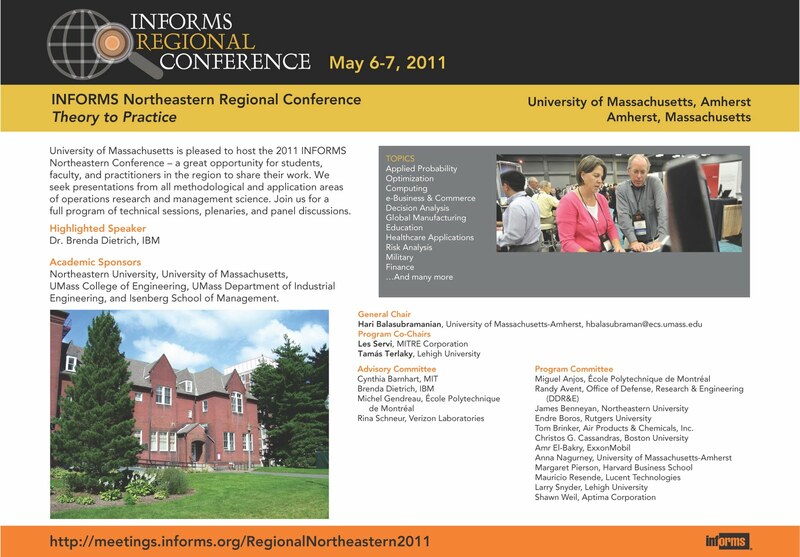 I wanted to give you an update on the first Northeast INFORMS Regional Conference that will take place May 6-7, 2011 at UMass Amherst! The deadline for abstract submissions is fast approaching and it is February 18, 2011! The committee that is organizing this conference is terrific with Dr. Hari Balasubramanian of the College of Engineering at UMass Amherst as the Chair and Dr. Les Servi of MITRE and Dr. Tamas Terlaky of Lehigh University as the Program Co-Chairs! Dr. Servi has already confirmed that Dr. Brenda Dietrich of IBM will be giving one of the plenary talks. She is the Vice President of Business Analytics and Mathematical Sciences, which is part of the IBM Research Divisions. She is also an INFORMS Fellow. It will be great to welcome Dr. Dietrich back to UMass Amherst. We have gotten terrific support for this conference from the University of Massachusetts Amherst from the Isenberg School of Management, the College of Engineering, and even the Office of the Vice Chancellor for Research and Engagement, so thanks to all!!! Hope that you can join us -- Amherst is beautiful in May! Congrats to Newly Elected NAE Members (with a Great Group of INFORMS Members)! Congratulations to the 2011 newly inducted Members of the National Academy of Engineering (NAE)! This group includes several very well-known INFORMS members, and I must say it is a very successful and deserving group -- John Birge of the University of Chicago, Amedeo Odoni of MIT, William Cook of Georgia Tech, Chris Hendrickson of CMU, and Christos Floudas of Princeton (who may not be an INFORMS member but is renowned in global optimization). Interestingly, both Odoni and Hendrickson work in transportation. Congratulations to all, and if I missed someone from our professional society, I apologize. John Birge spoke in our Speaker Series at UMass Amherst a few semesters ago and was terrific. The last time I saw him was at the Measuring System Risk conference that took place in Chicago, December 15-16, 2010. As for Amedeo Odoni, he was a dear friend of my dissertation advisor at Brown, Stella Dafermos, and together we wrote a tribute to her in Transportation Science. 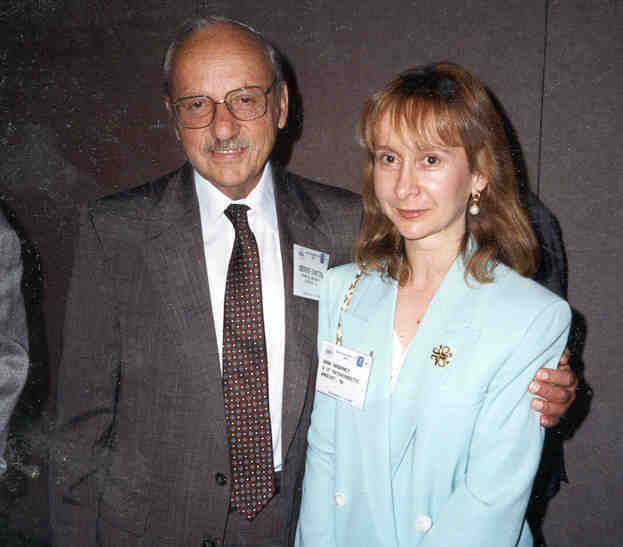 He was also the recipient of the Robert Herman Lifetime Achievement Award in Transportation Science in 2001. The full list of newly elected members is here. This Friday (and it looks as though the weather will cooperate) we will be featuring Mr. Marc Schneider from NYC in our new venture, "Meet the Executive." This event will take place at the Isenberg School and the students of the UMass Amherst INFORMS Student Chapter are hosting this event. I think that they did a great job designing the above poster. For 12 semesters this student chapter helped me to organize a truly amazing Speaker Series and now we have embarked on a new adventure! We hope to be bringing executives in to meet with students and interested faculty. 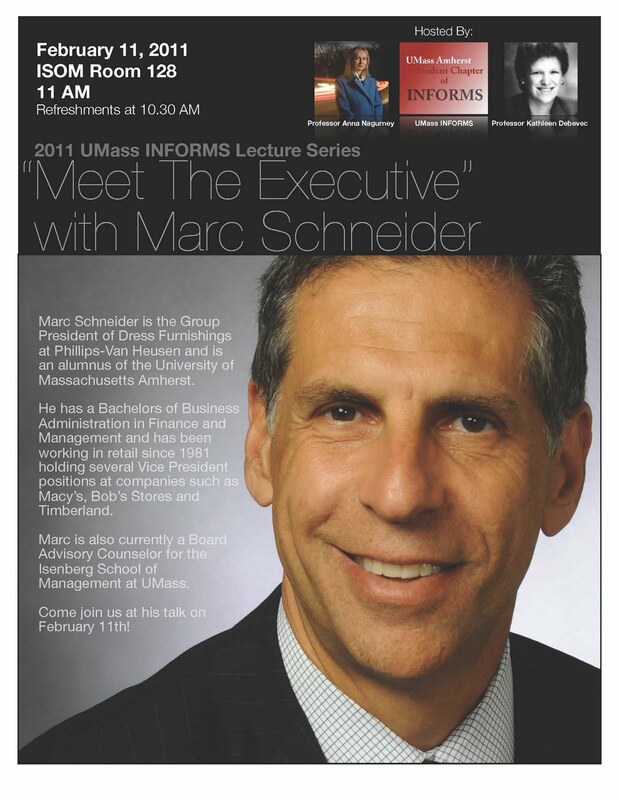 The UMass Student Chapter of INFORMS is happy to host guest speaker Marc Schneider on February 11th, 2011! Mr. Schneider is currently the Group President of Dress Furnishings at Phillips-Van Heusen, a position that he attained in connection with the newly created Global Supply Chain organization at PVH, and also is a Board Advisory Counselor for the Isenberg School of Business at the University of Massachusetts Amherst. He will be giving a brief talk at 11 AM followed by a Q&A. Refreshments will be served at 10:30 AM. BIOGRAPHY: Marc Schneider is the Group President of Dress Furnishings at Phillips-Van Heusen and has been with the company for four years. Prior to PVH, Mr. Schneider was with the Timberland Company for nine years as the Senior Vice President and Officer in charge of Global Product, Merchandising and Licensing. Before Timberland, Mr. Schneider was a Specialty Retailer for five years with Bob's Stores which was at that time a part of Melville Corporation. He was the Executive Vice President of Merchandising, Design, Planning and Marketing at Bob's Stores. Marc Schneider began his career at Macy's and spent 13 years there starting in the training program in 1981 and holding various other positions from Buyer, Counselor, Divisional Vice President and Group Vice President. Mr. Schneider graduated from the University of Massachusetts Amherst with a Bachelors of Business Administration in Finance and Management and is currently a Board Advisory Counselor for the Isenberg School of Management. ABOUT PHILLIPS-VAN HEUSEN: Phillips-Van Heusen Corporation, one of the world's largest apparel companies, owns and markets the iconic Calvin Klein and Tommy Hilfiger brands worldwide. It is the world's largest shirt and neckwear company and markets a variety of goods under its own brands, Van Heusen, Calvin Klein, Tommy Hilfiger, IZOD, ARROW, Bass and G.H. Bass & Co., and its licensed brands, including Geoffrey Beene, Kenneth Cole New York, Kenneth Cole Reaction, MICHAEL Michael Kors, Sean John, Chaps, Trump, JOE Joseph Abboud, DKNY and Timberland. Thank you for your continued support and we hope that you can join us for "Meet the Executive" with Marc Schneider on February 11th! As we endure a true winter in New England, and some of us are getting tired of the white, snowy landscape for weeks on end, despite its beauty, I thought it appropriate to write on "escapes." I love travel, and since I teach and conduct research on networks and especially transportation & logistics, travel is part of my "practica." My international travel is almost exclusively coupled with professional travel. I have also lived abroad in several countries, with these experiences being some of my very best. I gain inspiration from museums, whenever I have a chance, and art especially feeds my mind and my soul. One of my recent favorite museums that I had a chance to explore two summers ago while in Paris (where I spoke at two conferences) is the Musee Marmottan Monet. When I close my eyes I can transport myself to the perfect Sunday in Paris when my family and I visited this museum and were surrounded by Monet paintings followed by the most delicious lunch of baguette sandwiches in the neighboring park. The website for this exquisite museum housed in a mansion will break up this winter's whiteness. "Not taking the leap is comforting, because this is the American life," said Matthew Kepnes, international traveler and creator of NomadicMatt.com, a blog chronicling his travels and observations. "Breaking outside anything that is your norm is scary." Tourism experts and avid travelers attribute Americans' lack of interest in international travel to a few key factors, including: the United States' own rich cultural and geographic diversity, an American skepticism and/or ignorance about international destinations, a work culture that prevents Americans from taking long vacations abroad and the prohibitive cost and logistics of going overseas. If you can't get away but would like to feed your soul, thanks to Google and its Art Project, which was reported on in The New York Times, you can now take a virtual journey through some of the world's art museums. Above are some photos taken in Paris two summers ago. Of course, at this point in a New England winter, we may all just decide to move to Hawaii, where I spoke at a fabulous conference last May! With the Super Bowl game later today in Dallas (although the Patriots won't be there, the Steelers and the Packers will) I thought it appropriate to comment on sports and, in particular, on research, which is something that I love (I'm a fan of multiple sports and it helps that I teach at the Isenberg School, which also houses the outstanding Mark H. McCormack Sports Management Department). I just finished writing a research paper with a co-author that I have been laboring over with passion and it has certainly helped that we have had so many snow days in the past several weeks, which have allowed me to really focus on completing the paper. Writing a research paper, one has to focus on the goal -- to ask, first, the correct and interesting questions, and then to solve the problem/puzzle that will answer the question(s). When everything falls into place -- the theory, the solution procedure, and the data-based application -- one often experiences the euphoric feeling (which probably is what players and their coaches feel when a team wins a major playoff or the Super Bowl). Research requires strategizing (something that coaches and sports teams certainly understand and devote a great deal of time to), which involves not only what problems to work on, but also where to publish. It may also involve with whom to collaborate (think of the energy and funds expended in getting the right football lineup together or baseball team). Research requires intense discipline as does outstanding performance in sports. It very often requires team-work, since some of the most important and relevant research being done today is multidisciplinary (and that is another reason that I love working in my discipline since it relates to so many fascinating problems). Research takes time (sometimes it takes many years to crack a problem and in order to do it well one has to get the education and training for it) and it helps if one has the stamina for it. Just think of all those little leaguers, children soccer players, figure skaters, and even peewee football players, who train over years. Success in research can be measured in the personal satisfaction that one gets from doing a great piece of research, which sportsmen and women also feel through their outstanding, record-breaking performances. It is also measured by specific achievements -- from papers published, books written, invitations garnered to speak and to present one's work, and ultimately, perhaps, even awards for one's research. Of course, for more junior faculty, outstanding research is recognized by promotion and tenure, which should provide the foundation for additional great research (but, sadly, sometimes this does not happen for various reasons). Academic research and even industrial research involve competition (and professional sports thrive on this). Which team will be the first to decipher the genetic code of a species? Which country will win the next World Cup? Who will win the Super Bowl tonight (frankly, I am looking forward to the half-time show)? Star researchers also often get recruited by other universities or research institutes just like top players do but by other sports teams. And who cheers one on when it comes to research (and sports)?! There are fans of researchers as there are sports fans. The more citations that one's work gets (and, hopefully, these are positive citations) the more recognized the work becomes and the research team. Successful researchers, typically, get to travel a lot as do various sports figures, while competing, and even later in their careers as role models, motivational speakers, media stars, celebrities, etc. Successful research may also result in innovations that form the foundation for companies and result in outstanding products or services that generate financial compensation. Sports certainly generate, in some cases, exorbitant income for certain players. And, like sports figures who get elected to their sport Halls of Fame, top researchers (and obviously, there are politics everywhere) get elected to the National Academies and may even be recognized with a Nobel prize, the MVP of research! Research does not have to stop if one continues to have the passion, the energy, and the discipline for it (being healthy helps, too, I might add, and having/making the time for intense research). Just like sports, where activities such as Senior Games continue to draw competitors, even having an over 80 age class in some sports, one does not have to stop, but having a supportive work and family environment certainly helps. Of course, not everyone wins the Super Bowl or the World Cup, but just doing one's best, for as long as one can, is rewarding in itself! And remember, great coaching is also essential as is outstanding, devoted teaching and mentoring of the next generation of researchers and athletes! Info on the 2011 International Conference on Social Computing, Behavioral-Cultural Modeling, and Prediction (SBP 2011) is Now Online! I am delighted to announce that the 2011 SBP conference program, along with tutorial information, and keynotes, is now posted online on the conference website. The program committee has worked very hard and the conference speaker lineup is terrific. I might add that this conference has single track talks and all the talks are based on rigorously reviewed papers, which will appear in a Springer Proceedings volume, which is now in press. Come and learn about topics ranging from health issues via Twitter to optimization-based influencing of village social networks in counterinsurgencies to location privacy protection on social networks and even to promoting coordination for disaster relief -- from crowdsourcing to coordination! There will also be cross-fertilization roundtables.